In Zandvoort, especially in the summer, you can see many fascinating things. People love to come to Zandvoort for the dunes, the beach and the sea and many take part in sports activities such as kitesurfing, windsurfing and beach volleyball…. and paragliding, one of the more unusual sports you will see in Zandvoort if the prevailing wind conditions are favourable. Paragliders love to take advantage of the air currents on the top of the dunes but the weather and wind conditions really do have to be just right in order for this exciting sport to be safely practised. 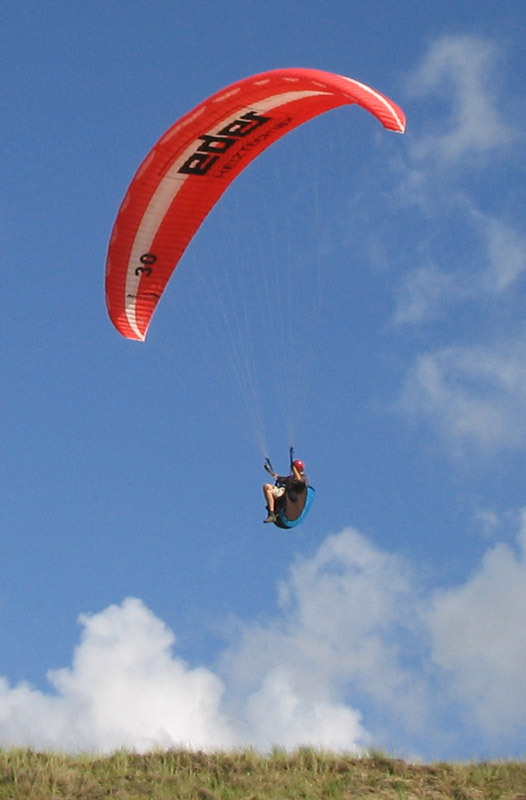 Paragliding may best be described as the recreational and sometimes competitive adventure sport of flying paragliders: free-flying, lightweight, foot-launched glider aircraft without any rigid primary structure. In practical terms, the pilot sits in a harness suspended below very large wing made of fabric which comprises lots and lots of interconnected baffled cells. Several factors effectively contribute to maintaining the stable shape of the wing: the suspension lines, the pressure of the air coming into the events on the front side of the wing and also similar to an aeroplane, the aerodynamic forces at work caused by the air flowing over the outside of the wing. Even though a paraglider doesn’t use an engine, it’s possible for him to maintain flight for many hours and for him to cover hundreds of kilometres although normally someone paragliding would probably only be out for an hour or two. this particular author has on many occasions been sitting at a cafe on zandvoort beach when a paraglider has come over often not many feet above much to the amusement and fascination of all the clients of the cafe. Here is a great video shot by two guys over the beach in zandvoort. It clearly demonstrates both the fun and the thrilling aspects of this fascinating air-based sport.